This authentic recipe for tortas de huauzontle, features the traditional Mexican vegetable wrapped in a light batter bathed in tomato sauce. It makes a satisfying vegetarian lunch that’s packed with protein, vitamins and minerals. Huauzontle — I couldn’t pronounce it but knew I wanted to eat it. Cultivation of this high-protein, heirloom vegetable dates back to pre-Colombian times when archeological records show it was so prized in the Aztec civilization, it was used as tribute and in religious ceremonies. It was banished by the Spanish conquistadores and joined the ranks of forgotten and overlooked vegetables where it languished for centuries. Now it’s enjoying a resurgence in popularity, due to its delicious, slightly bitter flavour and high protein content. It’s even possible to see it in Latin markets and purchase the seeds to grow at home. I had the opportunity to sample huauzontle at el Jardin de Rafaela Restaurant, located on Zicatela Beach in Puerto Escondido. Had I not been accompanied by dining companion, food guide and enthusiastic eater Gina Machorro, it would have been easy to walk right past the humble Puerto Escondido eatery. It’s hidden behind such a dense screen of palm trees across from Blater Hotel, it doesn’t even look as though there’s a kitchen there, let alone a complete collection of dining tables, hammocks and loungers. It would have been a shame to miss El Jardin de Rafaela. For more than 20 years, Senora Rafaela Pineda Pineda has been cooking up authentic traditional Mexican dishes. 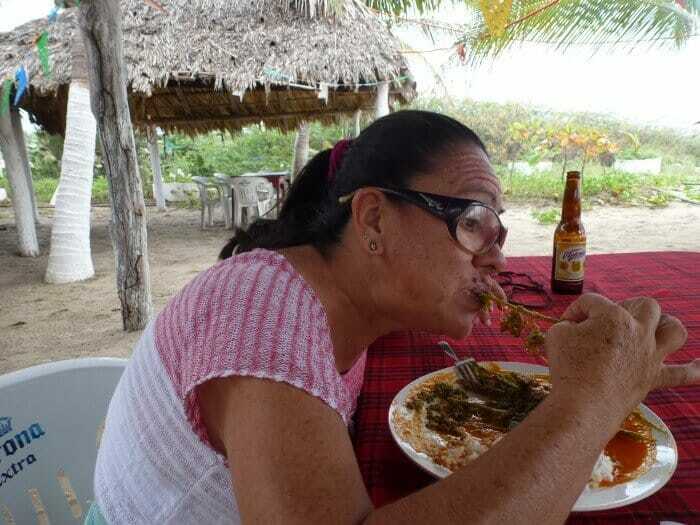 And because her cuisine reflect her roots in the state of Guerrero, she prepares regional dishes you won’t find many other places in Puerto Escondido — like huauzontle. What is Huauzontle and How Do You Pronounce It? Huauzontle pronounced “wah-zont-lay” is an ancient species of plant that’s both cultivated and grown wild high in the Sierra Madre Sur mountains in Oaxaca as well as other regions of Mexico. Its botanical name is chenopodium nuttalliae and it’s also part of the goosefoot family along with quinoa, lamb’s quarters and amaranth. Even in Mexico, it’s relatively uncommon to see it sold in the markets every day. In Puerto Escondido, it’s delivered by farmers only on Mondays and Fridays, so it has to be ordered a day or more in advance. Fortunately for me, Gina had done her homework, made the required phone calls and Rafaela and her staff were waiting for us when we arrived. Although slightly similar in spelling, Huauzontle should not be confused with Huitlacoche, an edible corn fungus that’s also popular in Mexico and one of the top foods to try during a visit to Oaxaca. 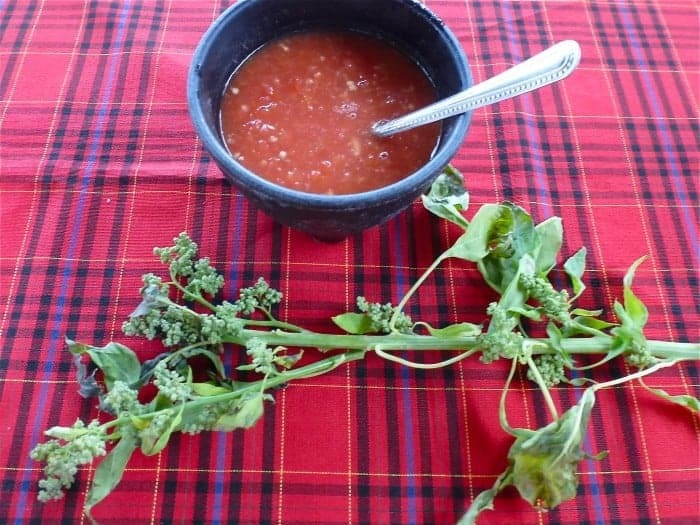 huauzontle – herb or vegetable? . 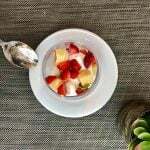 After a rather lengthy discussion about bee sting therapy (Rafaela’s other specialty is apiterapia, the medical use of bee venom for healing neurological disorders, MS and chronic pain), Rafaela shared her recipe for huauzontle. 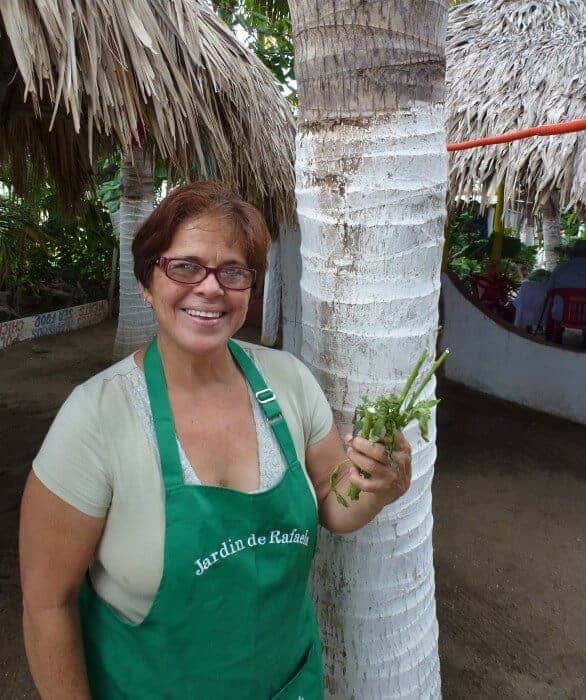 While it’s possible to prepare another delicious variation which calls for removing the buds and seeds from the stalk and using them to create small bite-sized tortitas de huauzontle, Rafaela said the traditional way for her family to enjoy it is to batter it whole. Handfuls of the thoroughly-washed and rinsed huauzontle (with the buds and seeds on the stalk) are first blanched until slightly tender. Then it’s drained and separated into handfuls which will serve as individual portions. Rafaela explained that she had prepared the vegetable by stuffing it with a stick of Oaxaca queso panela, a firm, salty white cheese. Then she rolled the vegetable and cheese mixture in flour. The bundles are then dipped in batter. The batter is similar to the one used for making chile rellenos ( stuffed poblano peppers). The batter is made by separating the eggs, beating the egg yolks until creamy and adding salt. Then, the egg whites are beaten until stiff and folded into the egg yolks. The bundled coated in batter are then fried in several inches of vegetable oil until crispy. It’s similar to my mother-in law’s recipe for Guatemalan green bean fritters. 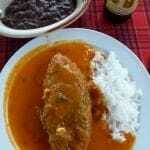 The tortas of huauzontle are then served topped with a simple tomato sauce with white rice and beans on the side. Eating the huauzontle looked a bit daunting at first glance. But I decided to follow Gina’s lead which basically involved using your teeth to scrape the tender green buds off a stalk the size and shape of an enormous baby bottle brush. Once I got the hang of it, I decided it’s a bit like eating corn on the cob, which means you eat everything except the inside stalk! What Does Huauzontle Taste Like? The taste of huauzontle seeds and buds are deliciously bitter, somewhat akin to rapini. But because huauzontle is a member of the quinoa family, the seeds also give it a slight hint of grainy earthy flavour. The stalk is not edible as it is too fibrous and extremely bitter. Although you might have trouble remembering how to pronounce the word huauzontle, trust me, if you eat it once and you’ll want it again and again. While we ate, I discovered that Rafaela has a treasure trove of other dishes that aren’t on the menu. She even makes my all-time fave dish — chile rellenos, which are poblano peppers stuffed with chicken, cheese, potato or beef picadillo. I’ll definitely be returning to el Jardin de Rafaela for more off-the-menu adventures and I’ll be making this dish whenever I spot a bunch of huauzontle or goosefoot. 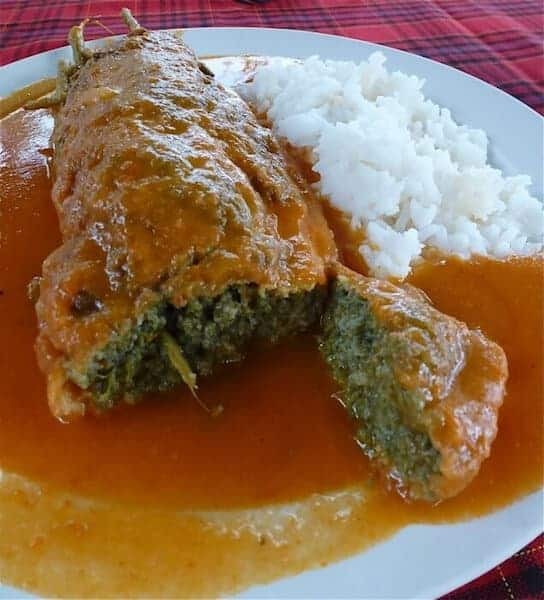 This authentic recipe for torta de huauzontle, features the whole stalk of the traditional Mexican vegetable wrapped in a light batter bathed in tomato sauce. It makes a satisfying vegetarian lunch that's packed with vitamins and minerals. Clean and wash the huauzontle carefully to remove any dirt and grit. Cook the entire stalk, seeds and leaves in a large pot of boiling, salted water for 5 minutes. Allow it to cool and drain throughly. Prepare the batter by separating the eggs, beating the egg whites until stiff then beating the egg yolks until creamy. Gently fold the egg whites into the egg yolks. Cut the panela cheese into long pieces. Divide the huauzontle into four portion-sized bundles and tuck the pieces of cheese into the seed and leafy sections of the cooled, drained huauzontle stalks. Then roll each bundle in flour, dip it into the batter and drop into the hot vegetable oil and fry until golden brown. Serve with a simple tomato sauce and a bowl of black beans. You can substitute rapini for the huauzontle if you'd like to try this recipe but can't find huauzontle. In that case, you should chop the rapini into pieces before putting it in batter. Feta cheese, mozzarella or Monterrey Jack can be used instead of the panela cheese. Nutrition calculations are estimated only. The scoop: You won’t find huauzontle on the menu so you need to call a day in advance to place your order. it’s delivered by farmers only on Mondays and Fridays so place your order in advance of those days. 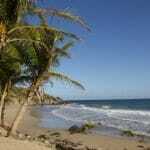 Plan to spend a few hours relaxing overlooking the Mexican pipeline surf or book a bee sting treatment. Location: Located oceanside on Calle del Morro in Colonia Santa Maria next to the Hotel Blater Beach Club past Azucenas. 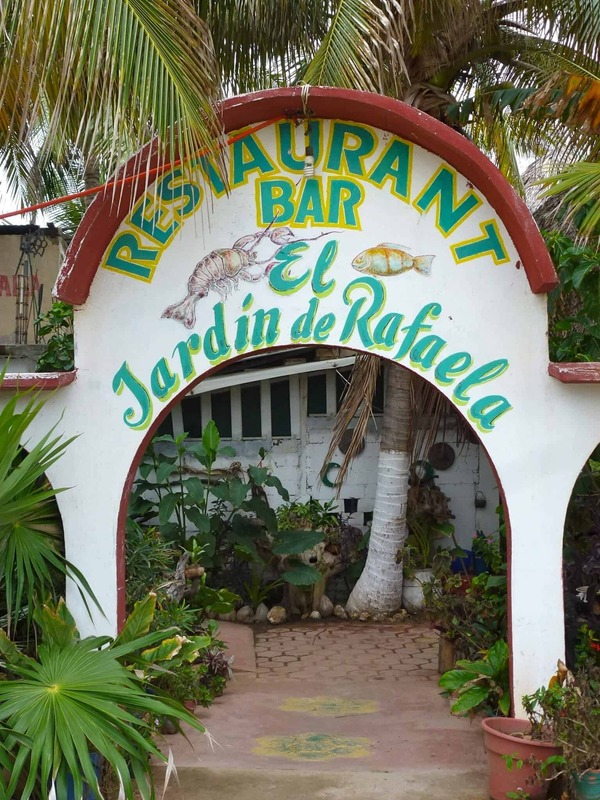 Cost: The menu items at el Jardin de Rafaela cost from 50 pesos to 130 pesos for main courses ( $5 – $10 USD). My meal was around 120 pesos ( including the beer). Food Tours: Contact Gina Machorro (GinainPuerto@yahoo.com) for more culinary adventures, such as her delicious walking tour of Puerto Escondido. 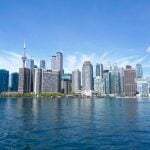 Book in advance for her market tour. Grow Your Own: It’s also possible to purchase the seeds for this specialty vegetable and grow your own huauzontle in a home garden much as you would quinoa. One source for the seeds is the Wild Garden Seed website. Rafaela’s garden looks amazing and the huahuzontle delicious. Thank you for posting these rare and wonderful examples of Mexico’s varied cuisine. This is sure not something one will find on resort buffets! I’ve never heard of huahuzontle, but I would certainly try it after reading your post. And other items at el Jardin de Rafaela too. Chile rellenos is also my husband’s favourite. Mexico continues to amaze me with its diversity of cuisines,spices and preparations. So enjoyed your description, and how to eat, this un-pronouncable treat. Sounds absolutely delicious though I can’t really imagine the flavour. What a treat to try something completely new. That looks amazing! Always nice to discover new foods. That looks fabulous. And nothing at all like the “Mexican” food we get here in the UK! 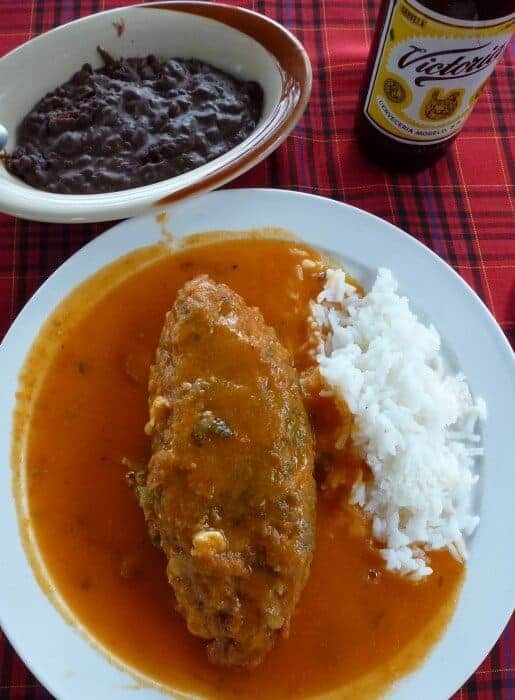 Uh Oh… you’ve got me craving chile rellenos which is also one of my favorie dishes. And I’d be game to try huauzontle – it sounds interesting and it’s always fun to try a new dish! I’ll definitely look for huauzontle next time I’m in Mexico. And that bee sting therapy sounds interesting to me! I seriously have never heard of huauzontle, but I imagine there are probably many foods I have yet to discover. It sure looks good. So nice that this restaurant prepares an ancient dish and preserves history! You’re not alone! Many people haven’t heard of huauzontle but interest is on the rise! OMG! That looks so amazing and has so many ingredients that I really love in it! Thanks for sharing the pronunciation. I would never have gotten that one right.